Dolphin Research Center is a not-for-profit education and research facility, home to a family of bottlenose dolphins, a spotted dolphin, and California sea lions. Over half of our family was born at DRC, while the other members have come to us from other facilities, or were rescued and deemed unreleasable and needed a permanent home. In addition to maintaining the best possible environment for the dolphins and sea lions at DRC, we also dedicate ourselves to assisting injured manatees in the wild. We are the only facility in the Florida Keys licensed to respond to and assess injured manatees. 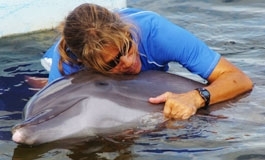 Furthermore, Dolphin Research Center carries on innovative programs in which dolphins assist humans with various mental and physical challenges. The dolphins continually show a unique ability to adapt their behavior to the needs of the participant. With humor, grace, and infinite patience, the dolphins challenge and motivate the participants to expand their skills. In a 1988 study, Dr. David Nathanson found that children with various disabilities learned up to ten times more effectively with the dolphins than in a typical classroom setting. Such positive results have led to worldwide interest in the program. Worldwide interest about dolphins in general opens the door for DRC to provide environmental education, fostering not only awareness, but also a desire to protect and preserve marine mammals and the environment we share. To reach as many people as possible, the Center provides a variety of educational programs that allow the public a chance to learn firsthand about the world of the dolphin. NARRATED DOLPHIN SESSIONS – are a wonderful introduction to DRC and our marine mammal friends. Throughout each day DRC offers narrated sessions that introduce you to the individual personalities of the dolphins through sessions involving research, new training, medical and husbandry behaviors, baby dolphins, playtime, and dolphin facts. 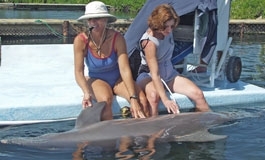 Of course, visitors are also encouraged to observe the dolphins on their own during their stay. Plan your day! PUBLIC WORKSHOPS – continue the learning process. DRC offers the public complimentary educational workshops inside our Dolphin Theater that cover such topics as dolphin maternity, dolphin societal structure, marine mammal conservation, etc. Outside, we also give the public insight into the lives of dolphins using a hydrophone to listen in on our dolphins’ underwater vocalizations and via our bio-fact cart, which includes such items as skulls, bones, baleen, etc. INTERACTIVE PROGRAMS – are offered to the public each day. From our Meet the Dolphin program in which participants give a dolphin a backrub and handshake, to our popular Dolphin Encounter, we have numerous programs that meet an ever-growing variety of interests and time schedules. We believe providing these types of opportunities allow people to build a personal connection to marine mammals that will hopefully inspire them to contribute to helping the ocean environment we share. Find out more about our Interactive Programs. The VOLUNTEER/INTERN PROGRAM – provides opportunities to experience DRC’s unique working environment. Although our volunteers do not work directly with the dolphins, they do encounter many opportunities for learning and experience various aspects of the daily operations of a marine mammal facility. Duties range from the strenuous to the mundane, but the satisfaction that comes from sharing in the care of our dolphins and other animals can offer rewards beyond measure. Learn about our Volunteer/Intern Program. DOLPHIN RESEARH CENTER TRAINING INSTITUTE (DRCTI) - Established by Dolphin Research Center in 2012, the DRCTI offers an Occupational Associate's degree in Marine Mammal Behavior, Care and Training. This program is built to help educate and inspire people for the benefit of marine mammals and the environment we share. The DRC Training Institute is licensed by the Florida Commission for Independent Education, License No. 4766. Learn more about DRC! Dolphin Research Center maintains a staff averaging 90-95 people and is organized into a number of separate departments that work together to form a cohesive whole. The majority of our positions are full-time. A department head that reports directly to the executive staff manages each department. The executive staff is composed of the President/CEO, the Chief Operating Officer, the Vice President of Animal Care & Training, the Vice President of Corporate Communications & Special Projects and the Vice President of Finance & Administration. They are responsible for all decisions made on behalf of the organization. ADMINISTRATION – The Administration Department lends corporate support to the executive staff in the form of clerical support, accounting, and human resources. In addition to assisting the executive staff, the accounting sector of Administration is responsible for all the financial areas of a not-for-profit corporation, including bookkeeping, budgets, balance sheets, and payroll. The department also includes Human Resources to recruit staff, administer employee benefits, act as a resource to employees for policy and procedures, and oversee employment regulatory compliance. ANIMAL CARE & TRAINING – The Animal Care & Training Department is responsible for the health and well being of DRC's dolphin and sea lion family. This department trains specific behaviors to the dolphins and sea lions that encourage mental stimulation, promote physical fitness, and help accommodate specific voluntary medical and husbandry procedures and research applications. Through their strong bond of trust with the animals, trainers are able to conduct the medical procedures used to monitor the dolphins' and sea lions' health. They also interact extensively with DolphinLab students, Special Needs Dolphin Pathways Program participants, and interns, providing unique insights into their dolphin friends. DEVELOPMENT AND SPECIAL PROJECTS – Funding is a challenge for all not-for-profit organizations. The Development team works with individuals, foundations and corporations who wish to support DRC's mission with significant monetary donations. This group of dedicated supporters contributes approximately $500,000 annually towards general support and specific capital projects. Providing information and, most importantly, saying thank you to this important group of DRC friends is a full-time job. Additionally, this department hosts special events like our semi-annual Founder's Weekend and other community-based activities that spread the DRC message. SPECIAL NEEDS – The Special Needs Department is responsible for assisting children and adults with disabilities to experience the world of dolphins in our unique interactive setting. The primary responsibilities of the department include coordination and implementation of the private Special Needs Dolphin Pathways program, providing assistance for special needs guests in our public programs, and developing research projects with other special needs professionals. This department works closely with the Animal Care and Training department in developing guidelines and techniques that promote positive experiences for all involved during the sessions. EDUCATION – The Education Department develops, conducts, and monitors educational programs for the public and special interest groups. 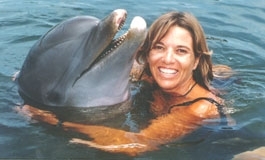 The primary responsibilities of this department include narrating dolphin and sea lion sessions for the public, conducting public workshops and educational activities, acting as liaisons for school and group field trips, as well as assisting the Animal Care and Training department with public interactive programs. 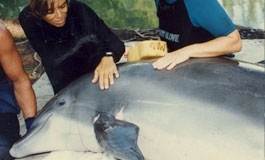 In addition, the department coordinates and implements the DolphinLab program, conducts public outreach (off-site presentations), and provides information services and educational media for the general public. ENVIRONMENTAL SERVICES – The Environmental Services Department is primarily responsible for the maintenance of the Dolphin Research Center grounds and equipment. Members of this department undertake both small and large construction projects, as well as attend to electrical, plumbing, boat, and automotive needs. The Animal Care and Habitat division is responsible for maintaining the animals' natural lagoons and creating the surrounding boardwalks, docks, and protective structures. This department provides a safe and efficient environment for both the humans and the animals at DRC. The Environmental Services Department also makes up the heart of DRC’s manatee rescue team. GUEST SERVICES – The Guest Services Department, also known as the Environmental Gift Shop, is our first link in the public relations chain. They are responsible for greeting visitors as they enter DRC, explaining the many programs that are offered, and answering questions of all kinds pertaining to DRC or marine mammals, in general. This busy staff handles all reservations and registration for our interactive programs and special tour groups, and assists the many thousands of visitors that come to DRC yearly. This department also oversees gift shop sales and inventory, manages the Internet web store, and coordinates telephone and mail communications. INFORMATION TECHNOLOGIES – The Information Technologies Department provides development and technical support services for DRC’s internal computer network, telephone and voice mail systems, Internet and e-mail, computer systems and software, and custom programs. MEDIA & MARKETING – The Media & Marketing Department is responsible for spreading the message of DRC through media contacts, marketing, advertising and public relations, and other forms of communication. The department works with television and movie producers, commercial ad agencies, and broadcast and print journalists to provide information, interviews and opportunities to visit our center. Working with the other departments, we coordinate the information on the DRC website and social media sites and contribute to the bi-monthly newsletter and other publications. MEDICAL – The Medical Department works in conjunction with the Animal Care & Training Department to maintain the health and well being of our marine mammal family, as well as to assess and rescue manatees. Our staff medical director consults with marine mammal veterinarians and specialists who visit routinely. Thorough, detailed records are kept on each of the animals in our care that document valuable husbandry and research data, of critical importance both for monitoring the health of individual animals and for building up baseline data to help in studies of wild populations. This department is responsible for processing laboratory samples, and ordering all medications, vitamins, and supplies used for daily care, necropsies, and critical care. Innovative methods to provide optimum treatment and care for marine mammals are continually explored. MEMBERSHIP – The Membership department builds and maintains relationships with the many people who want to help support DRC financially. A membership at DRC offers a unique connection between the dolphins and sea lions and the individuals that support them. Our membership program is vital to the survival of the organization. This department maintains contact with new and returning members daily about membership programs, updates on the dolphins and general information about DRC. The Membership Department raises approximately $300,000 annually and works closely with the Development Department on special projects and incorporating new fundraising ideas. RESEARCH – The Research Department is responsible for all scientific studies conducted at DRC. This close knit department works as a team to provide DRC with the scientific and logistical expertise necessary to take a research project from design to publication, in areas such as marine mammal cognition, behavior, calf development, and husbandry. Members of this department represent DRC at international science conferences on animal behavior, comparative cognition, and marine mammal science. They also play a large role in the research focused DolphinLab: Cognitive and Behavioral Marine Mammal Research. VISUAL COMMUNICATIONS – The Visual Communications department develops and produces DRC’s videos, photographs, signage and other visual media. DRC offers professionally-produced photographs for all of our public interactive programs, as well as providing images for use in all our workshops, presentations, and communications and for sale to the public. VOLUNTEER RESOURCES – The Volunteer Resources Department is responsible for assisting DRC employees by providing a supplemental work force capable of accomplishing daily tasks as well as special projects. Most of our non-local volunteers work 40 hours per week, during a four to eight week commitment. Local volunteers generally contribute at least one day per week. Our Volunteer Resources department also manages DRC’s Internship Program. Internships involve concentration in a specific department, normally last 3 to 4 months, and are held during the summer, fall and winter terms. Applicants do not need to be enrolled in college to be considered for an internship. This program utilizes staff members from the various departments to serve as coaches for interns. Working within a particular department is only one aspect of being employed with Dolphin Research Center. Crossover between departments is common. For example, a person who works in the Animal Care & Training Department may teach DolphinLab seminars to assist the Education Department; a member of the Education Department may occasionally assist Trainers down on the dock. Members of various departments may assist the Research department in taking behavioral observations. Crossover work not only adds variety to the workplace, but also provides employees with opportunities to expand their skills and utilize their talents in different areas. Employees from every department are involved in areas of their special interest through a variety of committees such as our media, research oversight, avian care, signage and conservation committees. Individuals cooperatively utilize their skills and talents to accomplish many vital tasks. True to the style of the Keys, Dolphin Research Center maintains a casual atmosphere. Dress is informal, workspace is limited, and the small size of the staff lends a personal nature to the facility. Because each employee works to provide a better understanding of marine mammals and the environment, the staff shares important goals. These common goals bond employees together. Staff is frequently referred to as the "DRC family." The cost of living in the Keys tends to be high and salaries, for the most part, are not competitive with the national average. This is particularly true at DRC, which is still maturing as a not-for-profit corporation. Starting salaries vary according to an applicant's educational background, experience, and particular job responsibilities. The starting annual salary for an entry-level employee at DRC averages $21,000. Many staff members find it necessary to supplement their income through other means. DRC offers an excellent benefits package including health insurance, a 401(k) plan, paid holidays, paid vacation, paid sick leave, gift shop discounts, work clothing, and complimentary Dolphin Encounters. However, the most important benefits are the extraordinary rewards employees encounter on a daily basis: feeling the elation when a dolphin demonstrates a new behavior for the first time, watching a child grin in excitement when she sees a dolphin burst out of the water into a flip, sitting quietly on a dock observing the fluid grace of dolphins, experiencing the sense of satisfaction when a student grasps a new concept, witnessing the magical moment when a learning-disabled child utters his first word. Moments such as these are the true rewards, the unique benefits of working at Dolphin Research Center. The educational background necessary to pursue a career with marine mammals varies. In some instances a high school diploma may suffice, while a Ph.D. may be required in others. 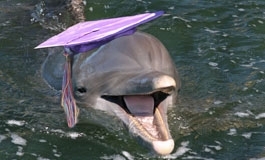 Deciding in what capacity you wish to work with dolphins will help you choose the most appropriate academic path. While the first thing many people think of is marine biology, degrees other than in the natural and biological sciences may better suit the needs of a particular department or position at DRC. For example, the degrees held by employees in various departments at DRC include communication, education, environmental science, psychology, and business management. Dolphin Research Center Training Institute (DRCTI) offers an Occupational Associate's Degree in Marine Mammal Behavior Care and Training. Go to http://www.dolphins.org/drcti for more information. Although having a secondary degree is desirable, some of our trainers got started by working/volunteering for zoos or aquariums in different capacities. When endeavoring for a secondary degree, a degree in biological sciences, husbandry or psychology will also provide a solid background. We do not advise undergraduate students to major in a specialized marine biology curriculum; specialization typically occurs with advanced degrees. Graduate programs in marine biology are competitive, and a strong foundation in the natural and biological sciences is required. If you are interested in pursuing a research career with dolphins, a strong academic background in research is recommended. You probably will need to obtain at least a Master's degree and preferably a Ph.D.
For those who want to work directly with animals, recommended courses at the undergraduate level include animal behavior, zoology, ecology, physiology, anatomy, genetics, cognitive psychology, child psychology, statistics and experimental design, and learning theory. Depending on your focus, other recommended courses are chemistry, physics, computer science, mathematics, environmental science, and marine biology. At the high school level, classes that offer a broad science background as well as math, computer science and language courses will provide a good educational base. In addition, we recommend that students get as much hands-on interaction with animals as possible. Many marine mammal facilities offer internship and volunteer opportunities, as well as other educational programs. Veterinarian offices and animal shelters are also valuable resources for hands-on experience. These types of experiences not only give students firsthand knowledge about animal behavior, but also help students to define their individual career goals.